When you're a veteran indie act who has worked in relative anonymity for almost a decade, and then you suddenly have a breakout moment, as Sweden's The Radio Dept. did in 2010 with their album Clinging To A Scheme and monster single Heaven's On Fire, the decision to follow up that breakthrough with a quickly assembled, career-spanning retrospective makes sense. Gather the best of your earlier material, package it all together, and then get the retrospective out there as fast as possible to lock down your new found fans. 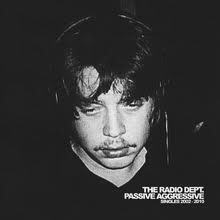 But for talented but undeniably limited B-Tier artists like The Radio Dept., such a move can also come at a price, for it can put your weaknesses in as stark a relief as your strengths, and that's exactly what happens on Passive/Aggressive: Singles 2002-2010. On the positive side, Passive/Aggressive's twenty-eight tracks make it abundantly clear that The Radio Dept. are marvelous drone-pop texturists. Whether going for soft and gentle (something they do quite often), or adopting a harder fuzz-guitar charge, just about every song on the album opens in a winning manner and sustains a breathy charm. Unfortunately, what this expansive set also makes clear is that musically speaking, the band is interested in little else. Get through the opening verse/chorus of any track on Passive/Aggressive, and you've heard all that song will offer...there are no gradual instrumental builds, no unexpected turns, no enticing solos or shifts in momentum...there's the opening design, and that's it. Obviously, this charge of non-progressive simplicity could be levied against the greater chunk of pop music throughout history, and it is a non-issue when taking in just a few of Passive/Aggressive's tracks at a time. But stretched out over twenty-eight songs with nary a change up, the band's avoidance of...if not outright disdain for...rock's more progressive techniques seems particularly problematic, and can become quite irksome when listening to the album in full. . Still, I don't want to focus too heavily on the negatives: there are a number of tiny indie-rock gems afloat in this plaintive dream pop sea, and overall it's a collection well worth hearing. And while each disc has its moments, I find that I consistently gravitate towards the more casual flow of B-Sides, instrumentals, and throwaways gathered on Disc 2 over Disc 1's more meticulously assembled singles...probably because a looser approach to anything only helps when dealing with this band. Cherry Pickers Best Bets: Where Damage Isn't Already Done, Pulling Our Weight, David, Heaven's On Fire, Leibling, What You Sell, Mad About The Boy, Messy Enough. Here's the video for 2006 single Pulling Our Weight. Have yourself a good long laugh. But I'm telling you, this 2011 comeback effort from 80s MTV stars Duran Duran isn't half bad, in no way the embarrassment one might expect from a band returning after such a long lay off. Is it cheesy? Of course it is...we're talking Duran Duran. Always a kitschy, crassly commercial act, if you never liked the band back in the 80s, nothing on All You Need Is Now will change your mind, primarily because though thirty years separated from the band's heyday, nothing sounds the slightest bit different. But if you're one, like me, who sometimes caved in to the catchiness of the band's slick, video-packaged but highly dance-able contributions to 80s new wave, one who leaves your XM 80s radio station playing whenever Rio or Girls On Film pops on, then you are going to find plenty to like here, especially on the album's exuberant front half. Highlights include the title track, the jamming Safe (In The Heat Of The Moment), best song Girl Panic!...which really captures the band's classic vibe...,the nice string interstitial A Diamond In The Mind, and the goofy but oddly engaging The Man Who Stole A Leopard. So go ahead, if you're of my generation, give in to your teen years nostalgia, and grant All You Need Is Now a listen. I think you'll find much of it to be an unexpected surprise. Cherry Picker's Best Bets: All You Need Is Now, Safe (In The Heat Of The Moment), Girl Panic!, The Man Who Stole A Leopard. Here's the video for Girl Panic!, which quickly makes it clear the band has lost none of its glitzy, made-for-televised consumption sensibility. 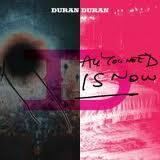 What are your thoughts on Duran Duran's All You Need Is Now? Following 2009's Stonesy self-titled debut, Kentucky's lively Cage The Elephant turns their retro-rock gaze clearly on the music of the 90s, with wide-ranging returns. The poppier and/or mellower tunes here work fairly well. Bubblegum single Right Before My Eyes is irresistible, 2024 is a hugely entertaining, spastic 90s era punker, and three blatant Modest Mouse ripoffs Shake Me Down, Rubber Ball, and Flow all come off well enough. But it's in its pursuit of the 90s more aggressive sounds, those of The Smashing Pumpkins, Ministry, Nine Inch Nails, and The Pixies, that Thank You Happy Birthday falls apart. Where other younger bands this year, particularly Yuck, seem to intuitively grasp the essence of what made hard-edge 90s alt-rock work, Cage here seems tone-deaf to it, capturing all the graceless, violent, abrasive ugliness of that noisiest, most atonal of decades, but none of the intrigue. In the end, the extreme poor quality of Thank You Happy Birthday's hardest numbers is too much for its two genuinely awesome tunes to offset, making it impossible for me to recommend the album in full on any level. Cherry Picker's Best Bets: Shake Me Down, 2024, Right Before My Eyes, Flow. Here's the official video for one of the album's Modest Mouse-flavored tracks, Shake Me Down. 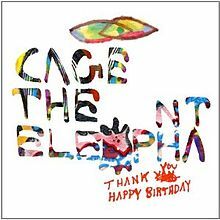 What are your thoughts on Cage The Elephant's Thank You Happy Birthday?